Flip Out Mama: On DVD Now!!! Kung Fu Panda: Legends of Awesomeness PLUS giveaway!!! On DVD Now!!! 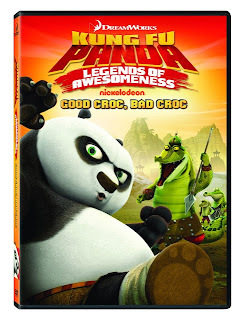 Kung Fu Panda: Legends of Awesomeness PLUS giveaway!!! Brace yourself for awesome action and legendary laughs in this fun-filled animated TV series based on the Academy Award®-Nominated hit movie Kung Fu Panda! As the chosen Dragon Warrior and sworn protector of the Valley of Peace, Po the panda is highly skilled, ever vigilant and hungry for justice...and dumplings. Together with the Furious Five—Tigress, Monkey, Mantis, Crane and Viper—Po must fend off fierce villains, including an evil version of himself (courtesy of the Mystical Mirror of Yin and Yang) and the toothy Croc Bandits! I love it!! Do your kids like Kung Fu Panda? Do you think they would like to win a copy of this DVD? You can enter to win one below!!! we received a copy of this dvd for review purposes. All opinions are my own, and are not influenced by outside means. My kids! They love Kung Fu Panda! with my 7 year old son and 5 year old daughter! Motor Oil Matters... and a #GIVEAWAY!!! Wanna Win??? GREAT Gift Hulk Giveaway!! !